Adding further, “the governor added that when opportunity came for Madumere to be Governor, Nwosu later had chance to be Chief of Staff and he preformed creditably, Okorocha said, “As at now he is the best Rescue Mission player! Based on that, he remains the most qualified to be my successor”. “Revealing on Madumere’s alleged sins, Okorocha accused his Deputy before the public of allegedly speaking ill of him before another fellow Governor, adding that what further surprised him was his second in command’s decision to remove his muffler and reportedly threw it back to him when the Senate offer was granted to him. “While claiming that part of the worst insult he received so far in the field of politics was not only the Deputy Governor’s refusal to join him in Abuja and run for the Senate of Owerri zone but the muffler issue. 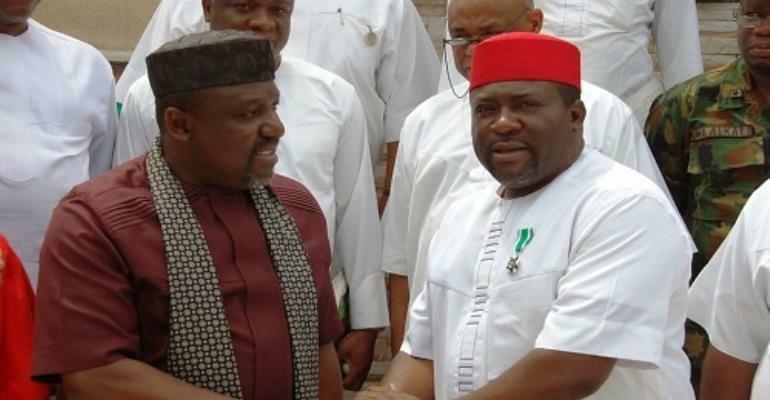 The meeting of Rescue Mission; the followers of Governor Rochas Okorocha in Imo State chapter of APC took another dimension yesterday, when the Governor, Rochas Okorocha berated some of his political soul mates and sister for allegedly turning their backs on him over preference for the choice of Chief Uche Nwosu, his Chief of Staff and Son in-law as a successor. At an the enlarged meeting that also provided a forum to interact with his followers drawn from all the wards in the state where a possible list of those to make the APC Excos at ward, LGA and state levels were drawn as well another mini mock congress for selection of candidates to run for political offices, the governor voiced out on his soiled relationship with allies who are not longer toeing his path in the present political dispensation. Wearing a pitiable look that suggests of being at a losing end of the unfolding political events, especially now preparations for 2019 elections and forthcoming congress of the party is underway, Okorocha lashed at his Deputy, Prince Eze Madumere by describing him as an ingrate who was nobody before he picked him up to become his Chief of Staff and later Deputy Governor. Going further in explanation, the governor added that when opportunity came for Madumere to be Governor, Nwosu later had chance to be Chief of Staff and he preformed creditably, Okorocha said, “As at now he is the best Rescue Mission player! Based on that, he remains the most qualified to be my successor”. Revealing on Madumere’s alleged sins, Okorocha accused his Deputy before the public of allegedly speaking ill of him before another fellow Governor, adding that what further surprised him was his second in command’s decision to remove his muffler and reportedly threw it back to him when the Senate offer was granted to him. While claiming that part of the worst insult he received so far in the field of politics was not only the Deputy Governor’s refusal to join him in Abuja and run for the Senate of Owerri zone but the muffler issue. The Governor almost shed tears at IICC, the venue of the meeting where he confessed that one of his major challengers in the plot to have Uche Nwosu become successor is Madumere, who he has accused of joining forces of late with “Abuja politicians to wrestle power from him. On Jude Ejiogu, Okorocha alleged that the Emekuku born banker turned politician should be grateful to him than join political enemies to against his desire as the former SSG received six appointments while in office from 2011 till he was removed in office. He accused Ejiogu of summoning meetings to discuss against him. Okorocha took on the sister, Ogechi Ololo and the husband, Engr Chuks Ololo who is aspiring to be a governor to the cleaners. Ogechi Ololo (nee Okorocha) has been serving as Deputy Chief of Staff (Domestic) until the Commissioner of Happiness and Purpose Fulfillment was added to her portfolio. In her case, Okorocha said that the sister and husband want to reap where they didn’t sow by way of not being in the picture from the onset. The Governor disclosed that it was after 2011 election he brought the Ololo family back from abroad and made the husband TC Chairman of Owerri North while the sister became Deputy Chief of Staff. He said that after making money from the appointments, they are now using the resources to battle him against Uche Nwosu ambition. Speaking on other appointees who are not with him on the Uche Nwosu agenda, Okorocha accused a former Commissioner, Ichie Best Mbanaso of allegedly being a tout in the past who he made Commissioner. In a jocular manner that attracted reactions, Okorocha stated that if he had not appointed Mbanaso Commissioner, the Orlu born former Works Commissioner would have found himself at the motor parks to engage in “Agbero” jobs. Commenting on Dr TOE Ekechi who is leading the APC Coalition Group to fight against imposition of Nwosu, Okorocha described his former information Commissioner as an ingrate and a saboteur who ignored what he did for him in the past to join forces with others against him. However, a tinge of drama occurred when the governor begged the state party chairman, Hilary Eke and his group not to dump him to join the Abuja group by admonishing them to stop all suspected “backyard business” henceforth and be with his Rescue Mission Group. While boasting that he will win again, the governor advised Madumere and Co to leave APC to another party than stay in the party to fight him. Okorocha claimed that he left APGA to form APC and won the election in 2015, stating that his Deputy and group can do so for 2019. When contacted on phone, a media aide to Mbanaso Casmir Nduruo described Okorocha as a “comedian Governor” and went further to advise that the Imo State Governor should apply to a popular actor John Okafor, aka Mr Ibu to be recruited as movie actor. Mbanaso who is suffering a suspected vengeance attack from Government forces however according to his spokesman revealed that the former commissioner spent N10m to bankroll Okorocha’s first election in 2011 claiming that it was the efforts of his brother Prof Jude Mbanaso who led other Professors to act as unbiased umpires to protect votes of Okorocha to enable him become governor in – 2011.